Construction workers and builders drive the residential, commercial and industrial infrastructure and development within Australia. The materials used within these industries are vital and finding reliable transportation to ensure these are delivered safely and on time is crucial. Whether it’s a large building or construction site needing a high volume of bricks or pavers or a smaller load of floor tiles for a renovated kitchen or bathroom, getting these materials to the site can be the difference between finishing the job or not even getting started. Find quotes for building materials transport today. Get 3 Quotes for transporting building materials. It’s free to request quotes. What building materials get delivered? Bricks: Due to the sheer weight of large volumes of bricks, relocating them can be a big job. When transported on pallets, bricks are neatly stacked and you can fit about 500 bricks per pallet. They can also be stacked and wrapped in a particular pattern that allows for space for a forklift to lift and load them. For larger loads you may require a crane truck to get them off safely and efficiently. Cement Bricks: Concrete blocks and cement bricks can be cleanly stacked onto pallets or strapped in bundles for transport, especially at larger quantities. 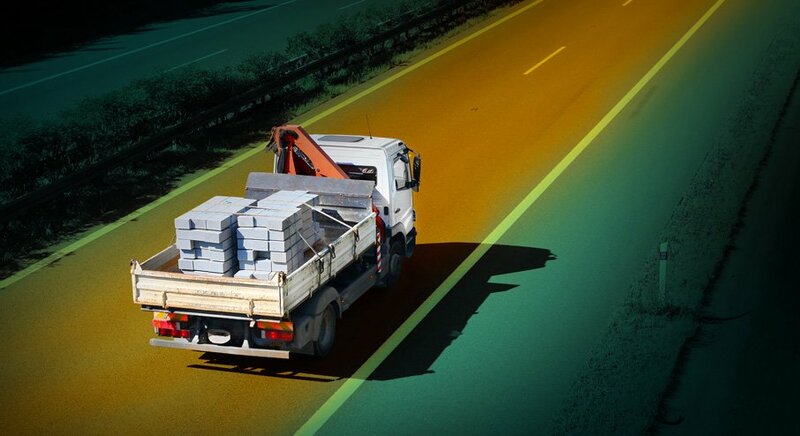 You’ll need a forklift for palletised or bundled cement brick freight in order to load and unload onto a smaller rigid truck or on the back of a flatbed truck or trailer. Floor Tiles: Floor tiles are some of the most delicate freight that is delivered to building sites and renovations. The tiles remain in the product packaging for transit and the boxes are stacked onto the pallet. These are then shrink wrapped and strapped for secure transport. Then depending on the quantity, this gets loaded to the back of the Ute, truck or trailer by a forklift. Pavers: For landscaping jobs, pavers are an essential part of most projects and lower loads can often be carried with Ute or small rigid truck. For big construction sites, you can be looking at a high volume of pavers to cover large outdoor areas. In this instance, a larger vehicle such as a standard flatbed, semi-trailer or crane truck is required. Roof Tiles: Roof tiles and shingles can be stacked against each other so they sit neatly in the shape of the tile. They can then be loaded to pallets or be secured into a crate, ready to be moved. Clay and slate tiles can be delicate freight to carry and you want to avoid any breakage whilst in transit, so wrapping the tiles tightly and securely to prevent movement is essential. Roofing Materials: Aside from roof tiles, the roofing materials that get shipped on a regular basis across Australia include corrugated iron roofing sheets, as well as guttering, downpipes, cladding and fascia boards. Roof plumbers require these products to complete almost every project or job that they perform which makes finding a reliable building materials transport company all the more important. Plywood Sheets: Plywood is a versatile material which is utilised for flooring, walls, roofing, shelving, cabinets and so much more. Plywood is impact resistant and they are extremely light weight but very strong, which makes them easier to move than some other building materials. Bundled stacks of about 60 sheets are tied with strapping to double pallets ready for transport. Plasterboards: At large quantities, plasterboards are relocated by plasterboard transport companies strapping stacks to prevent them from sliding during transit. They are then wrapped to protect from the elements and placed onto large pallets. A crane truck can then load the plaster onto the back of a flat bed and take it to the building site ready for the job by the plasterboard transporter. Particle Board: Chipboard or particle board is thicker and heavier than plywood but is still transported in the same way, sheets strapped together and put onto pallets. When particle board strips are shorter in width than a full sheet, they can be bound with strapping and the bundles loaded on top of each other. Cement Sheeting: Cement sheeting is regularly used in both commercial and residential construction and building jobs. Compressed cement boards are built thick and heavy for external purposes and that makes the load heavy and large. Internal fibre cement sheets can be stacked on pallets and loaded by forklift onto the back of a flatbed trailer. Polystyrene Sheets: Polystyrene sheets are extremely lightweight, making them easier to load and unload from the truck or Ute. They are not as strong, however, as the majority of other construction and building materials and therefore there is a degree of care that must be taken when building materials transporters are moving them for you. Flooring Materials: Materials used for flooring include wood/timber, slate, sandstone and ceramic floor tiles, as well as vinyl and laminate tiles. These materials are usually boxed and depending on the quantity you need delivered, can be easily loaded as they are. Glass Windows: Transporting glass windows can be performed by a company with glass racks fitted to the back of their trucks or Utes. Window frame trailers protect the glass from damage and allow for it to be upright in transit. Window Frames: Frames can be transported on the same glass rack trailers as individual sheets and can be shifted in the same load for easy transfer of all the frames and windows you require in the one load. Foam Waffle Pods: On a building site, waffle pods decrease the time associated with building or construction which makes them a valuable asset to any site. As they are light weight and square they can be stacked on pallets and shrink wrapped for relatively light and easy transport. Insulation Batts: Ceiling, wall and underfloor insulation batts can be moved on the back of a flat bed truck or trailer and for large quantities, they can be loaded onto the back of a curtainsider, especially if they need to be protected from the elements. Cladding Materials: Whether stacked and piled into bundles onto a flat bed or loose on the back of a ute for small loads, external cladding materials can be easily transported anywhere across metropolitan, regional and interstate areas. Screw Piers: Screw piers are used on most new build foundations and, therefore, they require delivery on a regular basis. If you need the excavator moved to the job or project as well, then the heavy machinery quotes page is where you’ll need to find the right building materials transport company for you load. Welded Bored Piers: Utilised on buildings and construction sites to create a secured foundation for structure built on top, welded bored pier cargo is often transported in bulk quantities. A flatbed truck or trailer will allow for plenty of room to get your piers moved anywhere locally or intrastate. If you work in building or construction then you’ll be moving materials from suppliers to the site on almost on a daily basis. We know you don’t have time in your hectic day to be calling around for quotes from building materials transport companies. Using our online tool allows you to submit the details of your job one simple action. This makes FreightQuotes a much better alternative to calling around for transport services yourself. Your request is then sent to the building materials transport companies registered with the FreightQuotes website and up to 3 truckies will contact you directly with a quote. Simple, quick and convenient. Building and construction material transport is available Australia wide. This includes interstate, regional and metropolitan freight covering all states and capital cities including Adelaide, Brisbane, Perth, Darwin, Melbourne, Canberra, Hobart and Sydney.